Raffaele Faraco, a graduate of the Julliard School of Music, was a longtime member of the Baltimore musical community. ​He toured the world as a violinist in the Baltimore Symphony Orchestra for 37 years, and spent 27 of those years as the Concertmaster of the Gettysburg Symphony Orchestra (GSO). Mr. Faraco became the Musical Director of the Gettysburg Symphony in 1990; he retired from the GSO in 1993. When he was approached with the Baltimore Philharmonia's organizational concept, he came out of retirement with the enthusiasm of a 200-piece orchestra! Following 13 years of extraordinary service to the orchestra, Maestro Faraco retired as Music Director of the BPO in 2011. 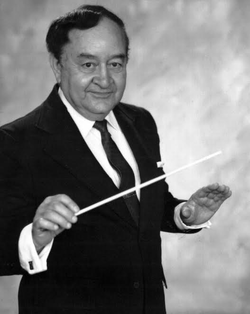 Mr. Faraco was then named Music Director Emeritus-a title he held until his death in 2016..